Whether you need to replace your existing HVAC equipment or add air conditioning to a home that has never had it before, Bill Joplin’s Air Conditioning & Heating has a wide range of HVAC products to meet your needs and your budget. From air conditioners, furnaces and heat pumps to air quality solutions and thermostats, we can provide a range of solutions that are both affordable and will provide comfort to your family. As part of the Carrier® network, we have access to local inventory supplies and can receive it in-house in as little as 24 hours on the rare occasion we do not have them in-house ourselves. 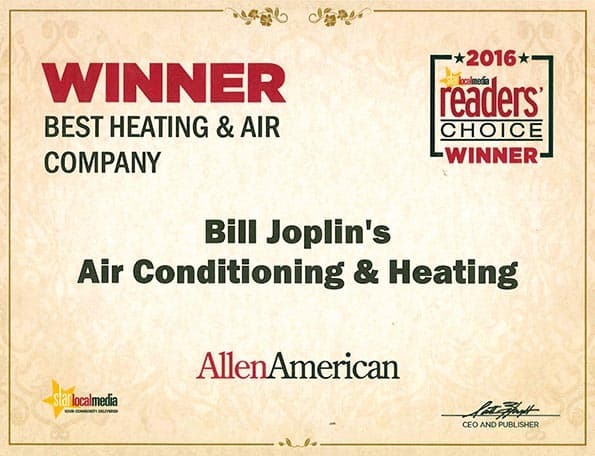 Let Bill Joplin’s Air Conditioning & Heating evaluate your current system and provide you with the most economical way to keep your home comfortable for your family. At Bill Joplin’s Air Conditioning & Heating, our Commercial Department provides a full range of services to clients. From maintenance and repairs to new installations, let one of our trained service technicians maintain your HVAC equipment and help to maintain a productive work environment. In the design stage of your next facility, we can help you design the most efficient and cost-effective system for your needs. At Bill Joplin’s Air Conditioning & Heating, all of our technicians are trained and certified by the factory. But we do not stop there. We provide on-going in-house training to ensure superior customer service and that the job is done right the first time. Rest assured that when you invite a Bill Joplin’s Air Conditioning & Heating Technician into your home, you will get a friendly member of our family to take care of your HVAC service needs. To schedule an appointment for Air Conditioning & Heating Equipment Installation, fill in the information below. Someone from Joplin’s will contact you shortly.